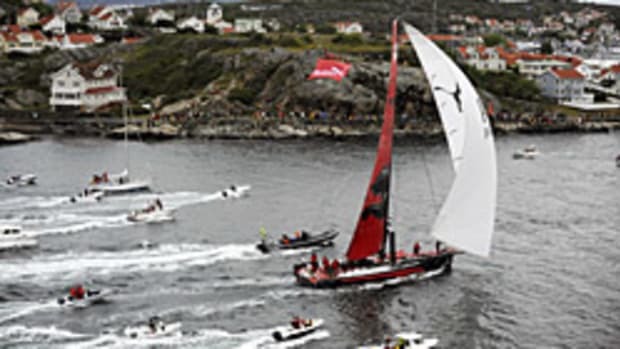 After setting out on Jan. 29 on a solo around-the-world record attempt, the skipper of Sodeb&apos;O crossed the finish line Thursday off Ushant island off northwest France after 61 days, 7 minutes and 32 seconds at sea. Thomas Coville took 3 days, 10 hours, 43 minutes and 26 seconds longer than Francis Joyon on IDEC in 2008. The paradox lies in the fact that the challenger&apos;s multihull was faster than the record holder. However, because of less favorable weather conditions, Coville wasn&apos;t able to follow as direct a route as that of the record holder. The skipper of Sodeb&apos;O covered 28,431 miles at an average of 19.42 knots, or 2,031 miles farther than Joyon, who covered 26,400 miles at an average speed of 19.11 knots. Click here for the Sobed&apos;O website.